The CCC was a public works program that operated from 1933 to 1942, as part of Pres. Franklin D. Roosevelt’s New Deal. It targeted young men and veterans in relief families who had difficulty finding jobs during the Great Depression, providing unskilled manual labor related to environmental conservation and development of natural resources in rural lands. This volume is the second state CCC project Martin Podskoch has completed. New York State was the first. Podskoch learned from the first research process the skill set needed to complete such an all-encompassing project. He interviewed many old men whose fond memories of their youth in the CCC remained strong. In his interviews Podskoch found that these men felt great pride in their work with the CCC, that it was a good time in their lives, for some the Best. Most agree they learned how to get along with many types of people. As you read what each man said you will come to know something of the time, to reach into the past and know what it was to be in the CCC! Volunteers planted nearly 3 billion trees to help reforest America, constructed more than 800 parks nationwide, updated forest fire fighting methods, and built a network of service buildings and public roadways. In nine years, 2.5 million young men participated in restoring morale and public appreciation of the outdoors. 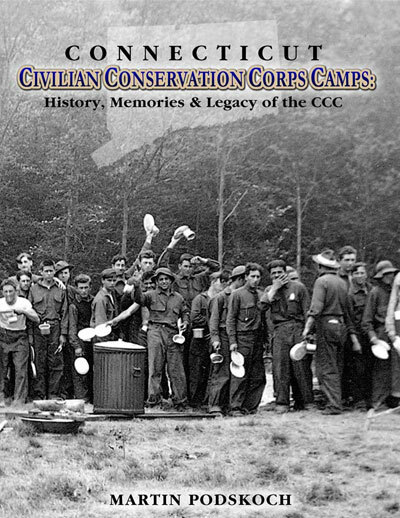 These young men worked in 21 Connecticut CCC camps while some traveled to Western states to do conservation projects. These interviews and hundreds of marvelous photos of camp life capture the vitality of the young men who worked so hard to improve our forests, which had been ravaged by fires, lumbering, and storms. We must not forget their labors in the woodlands and state parks that continue to be enjoyed by millions today. Martin Podskoch’s book describes the history and projects of the 21 camps located throughout the state. Camps were located at Housatonic Meadow in Sharon; Stones Ranch in Niantic, Connecticut; Natchaug State Forest (SF) in Eastford; Nipmuck SF in Union; Squantz Pond in New Fairfield; Meshomasic SF in Cobalt, Connecticut and Portland, CT; Pachaug SF in Voluntown; Black Rock SP in Thomaston; Tunxis SF in East Hartland; Mohawk SF in West Goshen; Burr Pond in Paugnut SF; American Legion SF in Barkhamsted; Salmon River SF in East Hampton, CT; Wooster Mountain SF in Danbury, CT; Shenipsit SF in Stafford Springs; Experiment Station Land in Poquonock; Macedonia Brook in Kent and three camps in Cockaponset SF in Killingworth, Haddam, CT and Madison Connecticut. Enrollees signed up for six months and worked a 40-hour week for $30/mo. The government sent $25 to the enrollee’s family and the enrollee received $5. The young men received good food, uniforms, and medical care. At first they lived in tents; later they lived in wooden buildings. These young men and special camps for war veterans were able to help their families and gain a sense of worth. There are hundreds of pictures of the boys at work and at camp, sometimes laboring mightily, other times clowning around or playing on camp teams. There are excerpts from camp newspapers of cartoons, poems, doggerel, and songs that will delight the reader for this unique window into their lives. Since most of the boys quit school after 8th grade to help their families, the Army organized evening classes for those who wanted to get a GED, learn vocational skills or just hobbies like photography. In precise detail the reader will see what the boys studied in the education classes, a wide variety of classes from Accounting (practical) to Drawing and Music (entertainment), and life skills. You will follow boys from city and village as they learn of the CCC, enlist, travel away, and become the muscle and bone that built the state parks, water projects, planting trees, and so much more. Their stories continue, most often through WW II, a return home to begin to use what they’d learned. There are stories of their families and their professional lives. After reading one boy’s life journey it is clear how much the CCC helped each one develop the character and purpose they carried through life.